Block Island is a 7,000 acre island, about seven miles long and three miles across at its widest point, located 12 miles from Long Island and about the same distance from Charlestown, Rhode Island. _The island is surrounded by dangerous shoals and ledges, and was sometimes called the "stumbling block" of the New England coast. Dozens of vessels went down near here in the years before the lighthouse authorities decided to build two lighthouses on the island: the North Light in 1829 and the Southeast Light in 1875. In 1856, Congress appropriated $9,000 for the building of a lighthouse at the southeast shore of Block Island. The Lighthouse Board decided instead to use the money to rebuild the existing lighthouse at the northern tip of the island, and the building of the Southeast Light was put off indefinitely. In 1872, a local merchant named Nicholas Ball circulated a petition for a lighthouse. The petition stated that vessels passing the southeast part of the island were "exposed to as much danger as at almost any other place on the entire coast of the United States." The Lighthouse Board agreed, and Congress appropriated $75,000 for the lighthouse. A ten-acre plot of land on Mohegan Bluffs was purchased from George G. Sheffield for $1,350 for the lighthouse site. President Grant signed the appropriation for the Southeast Light and later visited the station. _Cleveland Light in Ohio, built in 1870, had a very similar dwelling. Cleveland Light was discontinued in 1892 and was later destroyed. 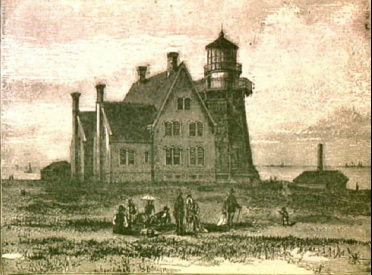 J. H. Tynan of Staten Island was the builder, working from plans provided by the Lighthouse Board. The building was designed to be an architectural showcase, and the melding of Italianate and Gothic Revival styles makes Block Island Southeast Light unique. The Southeast Light ended up costing about $80,000 -- $10,000 for the huge first-order Fresnel lens alone. The lighthouse was designated a primary seacoast aid to navigation, which meant it was equipped with the most powerful lighting apparatus available. The other primary seacoast lights in the area were Gay Head Light, Sankaty Head Light and Montauk Light. The fixed white light, illuminated by lard oil, was first exhibited on February 1, 1875. _The keeper's house, attached to the tower, was a 2 1/2 story duplex residence with twin 1 1/2 story kitchen wings to the rear. The building is brick with a granite foundation and trim. The octagonal tower is capped by a 16-sided cast-iron lantern. In 1875, fog signal experiments were conducted near the lighthouse site by Joseph Henry, chairman of the Lighthouse Board and director of the Smithsonian Institution. Henry studied the effects of weather conditions and air currents on the ability of mariners to hear the steam-driven fog whistle. A new compressed air fog signal with kerosene engines was installed in 1906. Two years later the fog signal house was destroyed by fire. A new building and fog signal equipment were soon installed. The present electronic fog signal dates from 1974. Because of its importance as a primary seacoast light and the added duties of maintaining the fog signal equipment, the Southeast Light had two assistant keepers. _ Nathaniel Dodge was the initial first assistant, and Charles Dodge was the second assistant. The light station was home to a family dynasty for its first 55 years of operation. Henry W. Clark, the first principal keeper, married Sarah Whaley, daughter of Joseph Whaley, the keeper at Point Judith Light. Their daughter, Bess, later married Simon Dodge, who was an assistant at the Southeast Light beginning in 1883. Dodge eventually replaced Clark and served as principal keeper from 1887 to 1923. Henry Clark’s son, Willet, spent an incredible 44 years (1886–1930) at the station as an assistant and later as principal keeper. Left: Three keepers of Block Island Southeast Light and their families. At the far left is Willet Clark, and the keeper farthest to the right is Simon Dodge. Courtesy of the Block Island Southeast Lighthouse Foundation. The spring of 1905 was an eventful time for the keepers. First, two hours before dawn on March 19, the steamer Spartan, bound for Philadelphia, ran aground in a light fog. Willet Clark was the first to discover the 222-foot vessel stranded about three-quarters of a mile from the lighthouse. The fog signal had been sounding properly, but the captain evidently had the vessel on a course that was too close to shore. There was no loss of life on the Spartan, but that wasn’t the case when the barge Texas was wrecked in thick fog near the lighthouse less than three weeks later, on April 6. The vessel had left Newport News, Virginia, and was headed to Boston with a shipment of coal. Four men from the lighthouse rushed to the scene of the accident and managed to get four crewmen safely ashore, but two others drowned. On April 28, 1908, while Simon Dodge was the principal keeper, the fog signal building was destroyed by fire. A new building was soon constructed and 13-horsepower kerosene engines were installed. Duplicate fog sirens were placed on the roof of a separate building about 100 feet to the southwest. They were relocated to the roof of the fog signal building five years later. Willet Clark, son of the first keeper, replaced Simon Dodge as the principal keeper in 1924. He stayed another six years. Clark had a mysterious knack for knowing when fog was on the way, and he would get the boilers going for the fog signal well in advance. He claimed that he could smell the fog long before it could be seen. In 1929, the Southeast Light was changed to a flashing green light to differentiate it from other lights in the vicinity. A new lens was installed with flash panels; it appears that this lens was made up of pieces "cannibalized" from earlier lenses. A mercury float assembly was added for the revolving lens. This system had replaced bearing and "chariot-wheel" assemblies in many lighthouses beginning in 1890. The hurricane of September 21, 1938, New England's worst ever, did tremendous damage to the lighthouse and grounds. The radio beacon was knocked over, the oil house was demolished, windows were blown out, and all power was lost. The keepers had to turn the lens by hand for several days. In 1939, a Texaco gasoline tanker was wrecked in a thick fog near the bluffs, creating a burning gas slick. Luckily, there were no injuries. The ship was later sunk by the Coast Guard and remains a favorite scuba diving site. In the photo on the left, Coast Guard light keeper Randy Wadsworth is cleaning the first-order Fresnel lens, circa mid-1980s. ​Wadsworth was stationed at Block Island Southeast Light in 1984-85. More than 30 years later, he said, "​My ears are still ringing from the foghorn. LOL!" ​Photo courtesy of Randy Wadsworth. The Coast Guard deactivated the Southeast Light in 1990, replacing it with a steel tower. Jean Napier, a descendant of the first keeper, said, "It's going to be a very sad day. I just hate to see it happen." U.S. Coast Guard photo, circa 1960s. _Petty Officer Steve Koskinen was the last Coast Guard keeper. One local resident, Marceline Mazzur, reflected, "It was a thing of beauty that we never thought would go away." By the early '90s, 115 years of erosion had put the lighthouse on the endangered list. The National Trust for Historic Preservation listed it as one of America's 11 most endangered structures of historic significance. The building, once over 300 feet from the edge of the bluff, was then only 55 feet from the brink. A dedicated group of volunteers, the Block Island Southeast Lighthouse Foundation, managed to raise about $2 million in federal and private funds to pay for the lighthouse to be moved. In August 1993, International Chimney Company of Buffalo, New York, and Expert House Movers, Inc. of Virginia, moved the historic structure to its present location about 300 feet from the bluff. The first-order lens had to be removed because it rested on a potentially dangerous mercury bed. Before the move. Photo by Cara Call. _It was later succeeded by another first-order lens that had originally been used at Cape Lookout Light in North Carolina. The restored light was relit on August 27, 1994. Block Island Southeast Light Station was named a National Historic Landmark on September 25, 1997. The restoration of the building is proceeding, with the ultimate goal of a museum and overnight accommodations inside. The Block Island Southeast Lighthouse Foundation operates a small museum and a gift shop in the lighthouse, and tours of the tower are offered in the summer.